These Crisps maintained an audible crunch throughout the eating process. As the Crisp weakened and eventually turned mushy we were left with the view that the process was fairly optimum in the crunch stakes. They were very crunchy, but did not have the sharp edges of some Crisps of this nature. 'Hand Cooked' is the phrase used in the UK for what are more commonly known as Kettle Cooked Chips elsewhere. The bag constituents were thickly sliced, featured a plentiful supply of oil bubbles and lots of visible skin on edges. There were a lot of irregularly shaped Crisps in the bag, and the pale yellow colouring was added to by powdery seasoning. A Nose Plunge Test revealed a notional Cheese aroma. It was not at all strong, but it was apparent. Some Crisps manufacturers really do not make it easy on themselves. 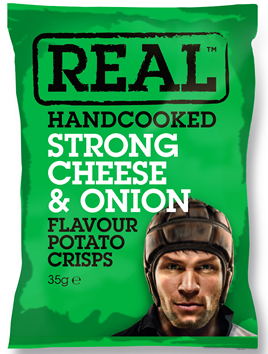 By calling these 'Strong' Cheese & Onion, we had every right to expect a strikingly obvious and powerful Cheese flavour. While the Cheese and the Onion flavours were well balanced, it was not in any way 'Strong'.